Angels & Urchins Like Mumsnet, but good. Pour Some Gravy on Me Same theme (yay!). Love the writing style, check it out. Single Slummy Mummy Mummy blog that is funny, which makes a change. The Left Room Writer Steve Mosby’s Blog. Don’t worry, I hadn’t heard of him either, but check it out. This is the guest post that appeared on Angels and Urchins Blog. Go over there and check out the blog anyway as it is brilliant and constantly updated. In an ironic twist of fate crueler than kids party in a plastic ice-lolly factory I now play more football than I ever have before. Not in a football strip, with goalposts, the offside rule, quarters of orange, fights outside nightclubs or adhering to any of the myriad of rules that govern today’s game – no; I kick a football gently towards my children, I make exaggeratedly bad saves and I use two balls so that UEFA doesn’t turn into WWE. I am not saying that I miss Sunday League football with the lads, because I don’t…mainly because I never played Sunday League football with the lads…mainly because of one of my biggest disappointments and regrets: I can’t play football for toffee. Even in goal. I have all the qualities needed to be a good player. I am tall, I can run quite fast and I am ambidextrous – I could practically make the England Squad with these qualities alone. But my greatest handicap is my brain: it’s just too clever. I just don’t have the slack-jawed, vacant stupidity required that enables one to pursue footballing as a professional career. Interviews with the average footballer render the expression the lights are one but no one’s home into a sparkling tableau of metaphors. But I think it’s more The lights are on but no one’s home…in fact, they’ve moved out and taken the furniture. So when I was a kid I was always the last to be chosen, and would spend the entire game kicking mud around in defence. Which – to be honest – I was good at. So not having the ability to play football at even an average level is harsh but what I wasn’t expecting was that I would be watching less football. I love football, my surrogate parents were Des Lynam and Alan Hanson. I knew just about every player, in every position of most Premier League clubs, some Championship clubs and a great deal of European sides. I could, with a degree of integrity, mutter the phrase: ”e’s a decent player, great first touch and ‘e knows where the goal is…’ Now I haven’t got a clue who anyone is – apart from the big names – and I don’t have the time to watch Match of the Day (Grazia for football fans, ladies…). It’s like I stopped watching Eastenders when the Mitchell brothers were running the Queen Vic and now it’s full of old cast offs from The Bill and Hollyoaks. I can’t kill sabretooth tigers anymore, I need football and cars to express my manhood – dammit! Oh…but it’s the World Cup and my kids are now old enough that I can watch an evening game without disturbance. For two weeks I am going to gorge myself on football, I am going to fill in wall charts and I might even buy myself a Panini Sticker Album and do swappsies with the local swizzer kids. Beer, sunshine and footie = bliss. BUT – and this is a big, Nike sponsered, hairy BUT – I am changing the future. 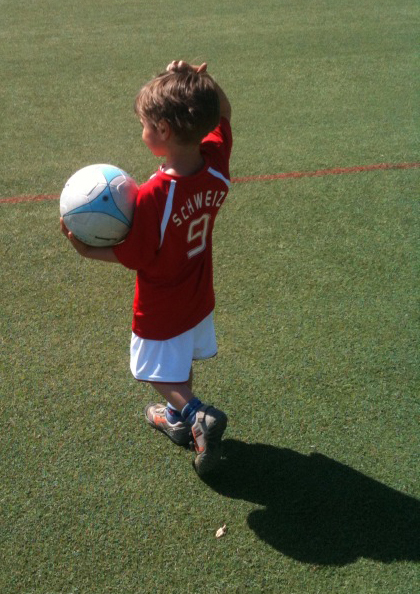 My son is learning how to play football – at the tender age of 3 ½ – and his footballing prowess will be the stuff of legend. He’ll be like a cross between Messi and Kaka but with the ability to tie his own shoelaces, use cutlery and read. The only fly in the ointment is that he is learning in Switzerland – a football Death Valley – but I have determined that if the bar is set low enough he can only over-achieve. He’ll be better than me at any rate. I love the picture : at least that footballer is scratching his head, wondering where all the others have disappeared. How can he get the ball back “en jeu” if there is no one close by to get it? Are they all hiding behind the net? How’s it going on the old football rollercoaster, MrS? We happen to have an American living with us at the moment, and she feels her team could have done better. We’re doomed, I tell you, doomed. I feel like one of those kids on Jim’ll FIx It who asked to eat a McRonnies on a rollercoaster and ended up with milkshake over their faces. Supporting England is a depressing activity more likened to self flagellation than an enjoyable activity. excellent post, you made me laugh out loud! there’s nothing like living vicariously through your kids viz. our daughter going for synchronised swimming team try-out this week (tender age 6).